Democrats at their national convention Tuesday night seemed more willing to mend fences to stop Donald Trump from becoming president than the Republicans are willing to make nice to prevent Hillary Clinton from becoming president. The Democratic roll call vote was finally moved to unanimous consent by Vermont Sen. Bernie Sanders, the unfairly treated presidential aspirant who was willing to overlook the Democratic National Committee’s anti-Semitism and betrayal of its implicit neutrality, as long as Debbie Wasserman Schultz lost her position as chair of the Democratic National Committee. She did, and Bernie fell in line, calling powerfully for “unity,” as have most of his supporters, it appears. Before Bill Clinton’s speech was a selective tribute to Hillary. This was a night in which mothers who lost children in violent acts — some of whom were killed by individual miscreants, such as was Trayvon Martin, and some of whom were vicious criminals, such as Michael Brown, and some of whom were completely innocent of any wrongdoing — appeared to support Hillary Clinton. There had been no similar concern for police officers murdered in America, a moral and political oversight. But more significant politically was Bill’s speech — a man called by CNN’s Anderson Cooper “the big speaker of the night”– which was nervously anticipated for a number of reasons. He is a mesmerizing speaker when he doesn’t go on and on and on. He is known as a charismatic policy wonk and on top of all issues. 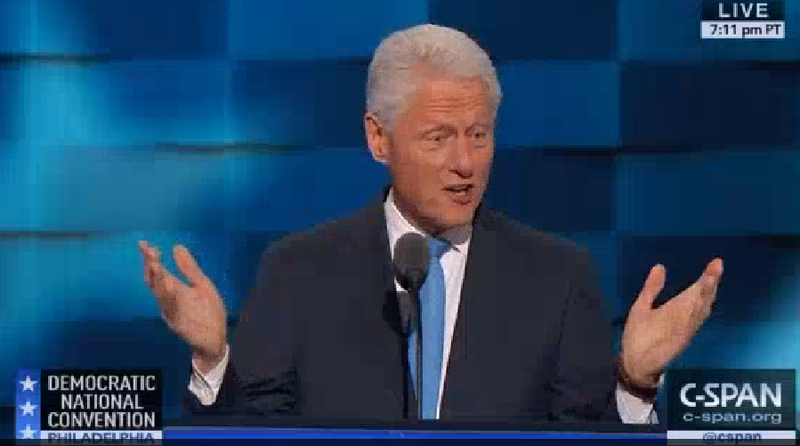 But the question was whether Bill Clinton is still Bill Clinton. Some thought his sharpness and precision had diminished, and others were and are sure his political judgment has been compromised. This goes beyond some of his ham-handed support for his wife’s candidacy to its pinnacle in his ill-conceived meeting, to understate his misjudgment, on an Arizona tarmac with U.S. Attorney General Loretta Lynch arguably to try to influence the Justice Department’s disposition of the email case against Hillary Clinton. Preceded by Clinton Secretary of State Madeleine Albright, who finally made the argument that Hillary has accomplished something in foreign policy — prevented nuclear proliferation — Bill Clinton’s speech was next. His voice was a little more raspy than years ago, but his metaphorical voice was powerful and impressive. He didn’t speak too long, and as a rhetorician he still has it. He was welcomed with powerful cheers and looked great. Bill gave the history of his relationship with Hillary and her early aggressiveness in their relationship. He referenced the good and bad times with admiring compliments throughout as well as her change of parties pursuant to her rejection of the Vietnam War. She was, he claimed, interested primarily in public service to the poor, showing her early commitment. Along the way he dropped the names of liberal heroes like Marian Wright Edelman and a variety of states to the joy of delegates at the convention. He related Hillary’s disinclination to marry him due to her social commitments to the disabled and others. But his story of how he chased her, his “best friend,” and won her by preemptively buying a house she loved was compelling, even if perhaps not completely true. All through, Bill emphasized Hillary’s policy interest and involvement — and good political counsel, accounting for much of his political success — with a genuinely smiling Chelsea giving her parents an important imprimatur. His self-effacing message: she walks the walk more than he and is indefatigable. He made the only case for Hillary’s successes in foreign policy, arguing that Hillary got sanctions passed against Iran and helped forge the (controversial) nuclear treaty. There was no defense or mention of the email scandal or the Clinton Foundation or Benghazi representations to families of victims. But he, unlike every other speaker, importantly voiced support for police. Bill Clinton does quickly sneak in the fact that we have to help those in coal country, contrary to Hillary’s gaffe promising to abrogate their jobs, but ostensibly she dispatched them there. No matter…if this speech does not at least temporarily buoy Hillary’s support, this critic would be quite surprised, to say the least.